Rowing began their adjusted schedule early this morning in an effort to make up for all of the time missed yesterday. 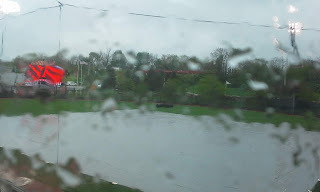 Softball and baseball are in opposite boats as it relates to getting to continue their games today. Softball is currently leading in the top of the fifth inning, but their game cannot go official without finishing that half inning. 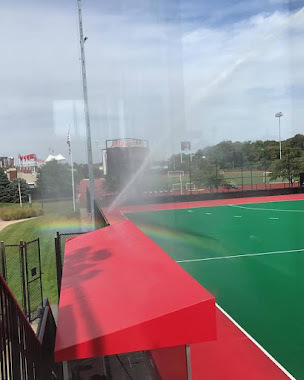 As teams are not allowed to play more than two games in a single day, if finishing this game pushes until tomorrow, the Cards will have to cancel one of the games scheduled in tomorrow's double header with GT. 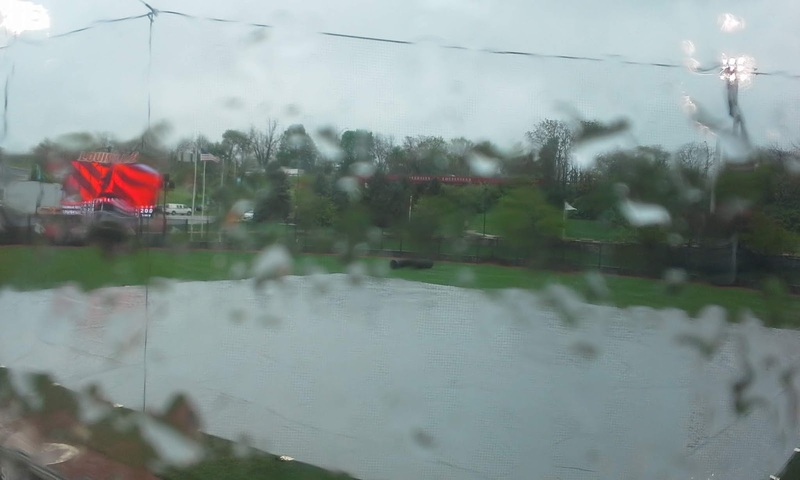 Baseball, though, has no incentive to continue play today. There is still one more game scheduled for the Cards, but they have a game of their own to finish. In this one, Louisville trails 10-3 in the bottom of the sixth. Why wouldn't they want a chance to come back, you ask? That would be because the Cards led 3-1 after 5 full innings, which is enough to make the game official. If Louisville and Miami can't complete the sixth inning before 6PM tonight, the time the ACC requires teams leave on a get-out day, the score will revert back and the Cards will be victorious. We'll see what the weather does in Louisville today, as forecasting spring weather in the Ohio Valley is about as pointless an exercise as you can imagine. joined by women's tennis, track and field, volleyball and lacrosse. None are at home. 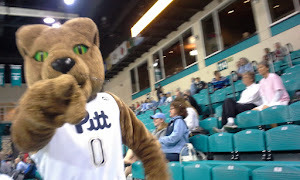 Tennis is at the ACC Championships, while track and volleyball stayed closer to home. Track is at the Kentucky Invitational and the volleyball team traveled down to Morehead. 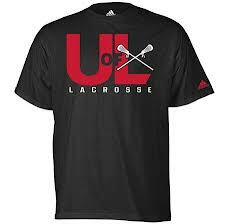 Perhaps the most interesting event of the day is Lacrosse's matchup with the number one team in the country. 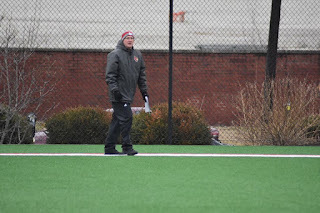 Scott Teeter has taken his squad up the coast to Chestnut Hill to take on Boston College. Every game in the ACC is a brutal matchup for the Cards, but as we said last week, you have to beat the best to be the best. Today's game is at noon and is available on ACC Network Extra. With Jared at the bank and me down at the farm, the studio won't be quite full today. 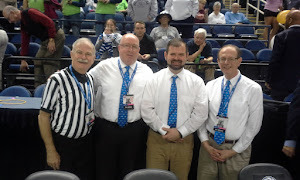 Paulie and Jeff will be joined once again by Daryl Foust, where I imagine yesterday's softball shenanigans and the victory for the diamond Cards in the Battle of the Bluegrass will be quite the topic of discussion. 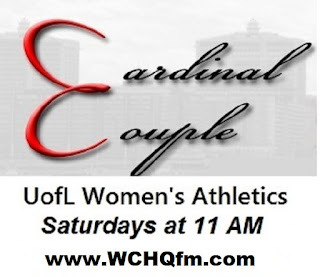 Tune into WCHQ FM at 11 AM for the Cardinal Couple Radio Hour. The station is available at 100.9 FM in Louisville and online at wchqfm.com, the WCHQ App, or Facebook Live. 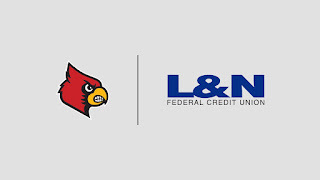 It was announced yesterday that L&N Federal Credit Union has donated $2 million to UofL Athletics to help fund upcoming projects. 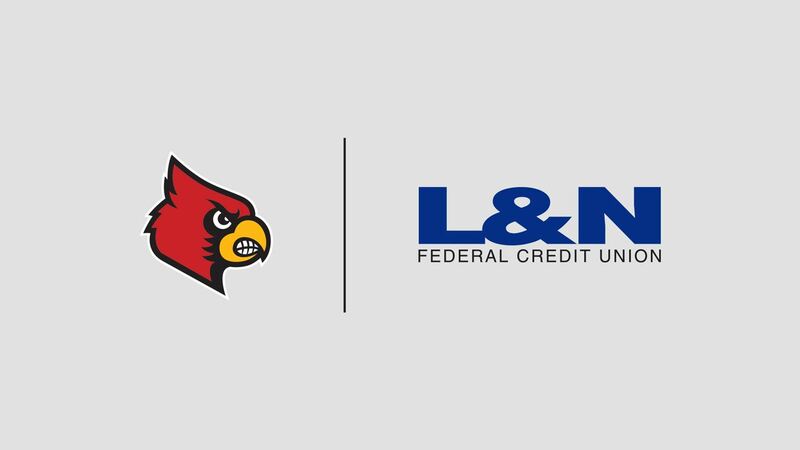 Cardinal Arena will be renamed to L&N Federal Credit Union Arena for their generosity. The funds are expected to be divided between all Division 1 sports as well as upcoming projects. How the funds will help the volleyball program and their newly named arena has not yet been announced. Concerns regarding donations and financial stability arose following the departure of Tom Jurich but it appears Vince Tyra and the UofL Fundraising crew has things well in hand as they continue to make UofL Athletics profitable and continue to find large donors. 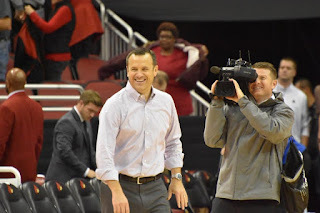 No, Jeff Walz is not leaving UofL. However, the legendary coach has been named head coach for a special occasion. Walz will command the USA U19 World Cup basketball team this summer. 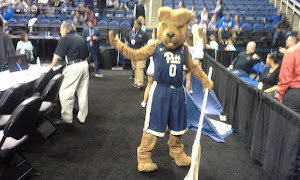 His staff consists of Natasha Adair (Delaware) and Cori Close (UCLA). 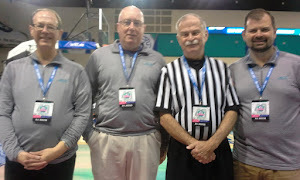 This staff led the 2018 USA Women's U18 National Team to a gold medal in the 2018 FIBA U19 World Cup. The 12-member team will be selected following the trials May 16-20. Training camp is July 5-19. The U19 World Cup will be held in Bangkok, Thailand from July 20-28. As comes inclement weather so do changes to the schedules. Softball has pushed their series opening game against Georgia Tech up to 2:00 today in hopes of beating the rain. The 1:00 Saturday and noon Sunday games are still scheduled as normal. 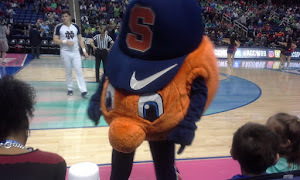 Why the ACC chose to play games on Easter continues to baffle me since regular season games are cancelled on holidays such as Thanksgiving, Christmas, and New Years Day. 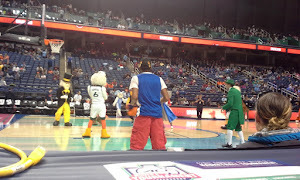 Golf is down in Greensboro in the midst of the ACC Championships. As of last night they sat 6th out of 12 teams and will continue play for the next couple of days. There have been no changes to the schedule as of right now but things are subject to change. 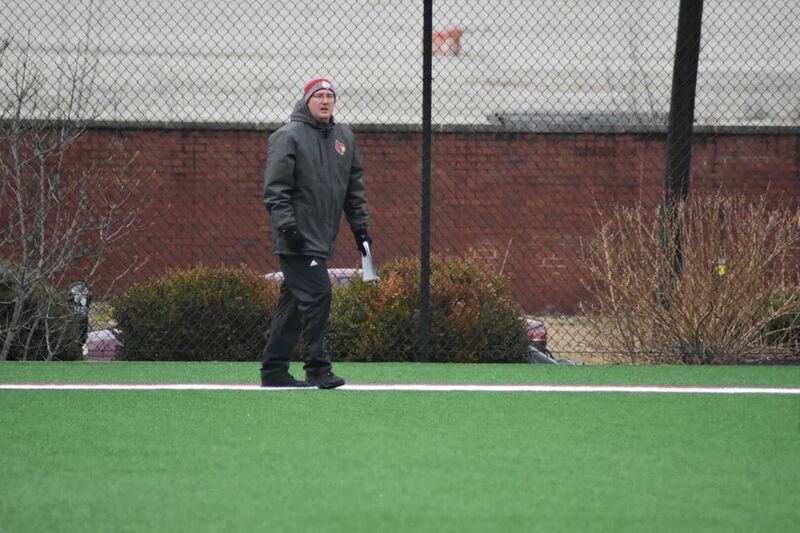 Lacrosse will wrap up their regular season on Saturday at noon up north against Boston College. The Eagles sit atop the NCAA rankings and proudly carry an unblemished record after 16 games. Rowing will be enjoying the Palmetto State today and tomorrow as they compete in the Clemson Invitational. Rowing does an excellent job of updating their Twitter account throughout the event. Happy Friday, enjoy your Easter weekend, and Go Cards! 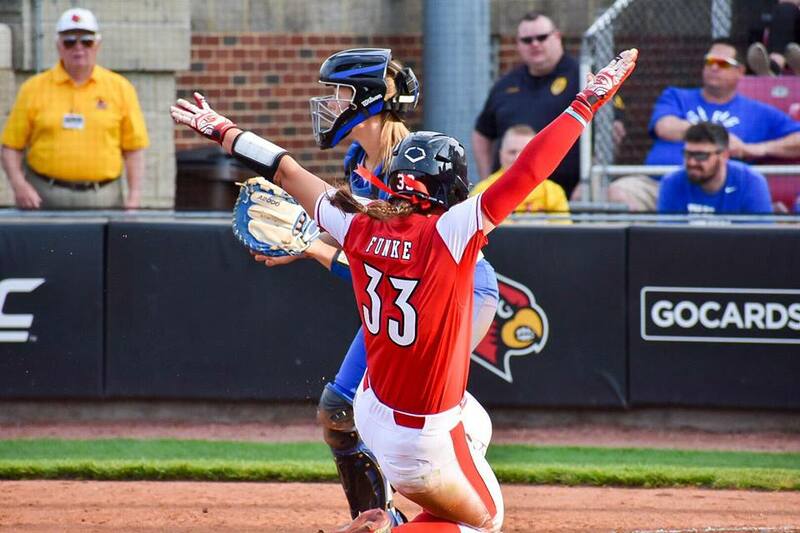 This Louisville Softball team has a flair for dramatics, it seems. 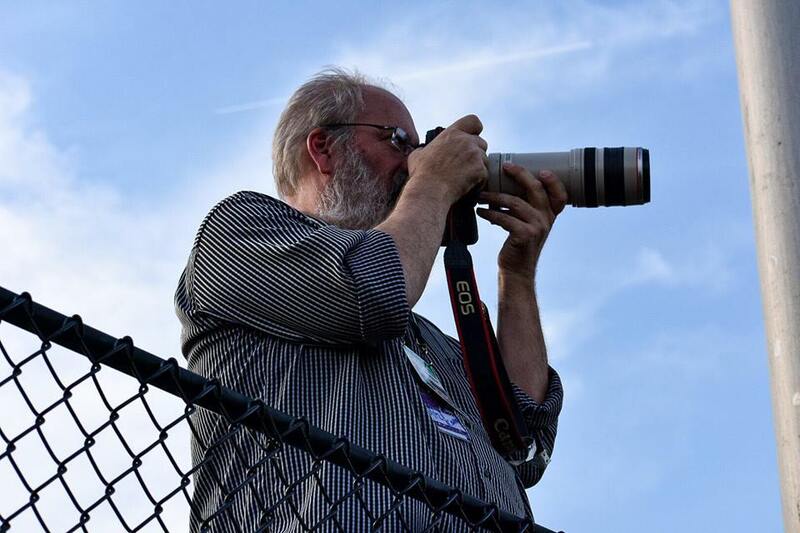 Patron saint of photographers Scott Utterback does work. 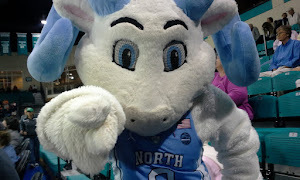 The lot of them could probably do well as theater majors on the Belknap Campus -- keeping the crowd engrossed in this entertaining mystery that, at times, neither team seemed to want to in or lose. Plot twists, heroes, villains, comic relief and a spectacular ending in this three act, who-will-emerge victorious nail-biter. Another instant classic, from these softball student-athletes. 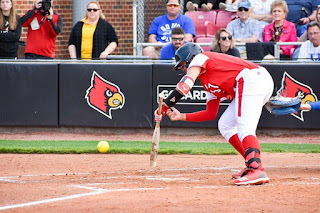 In a back and forth, see-saw slug-fest against UK last night at Ulmer Stadium, the Cards struck last -- and best -- when they broke a 7-7 tie in the bottom of the seventh. 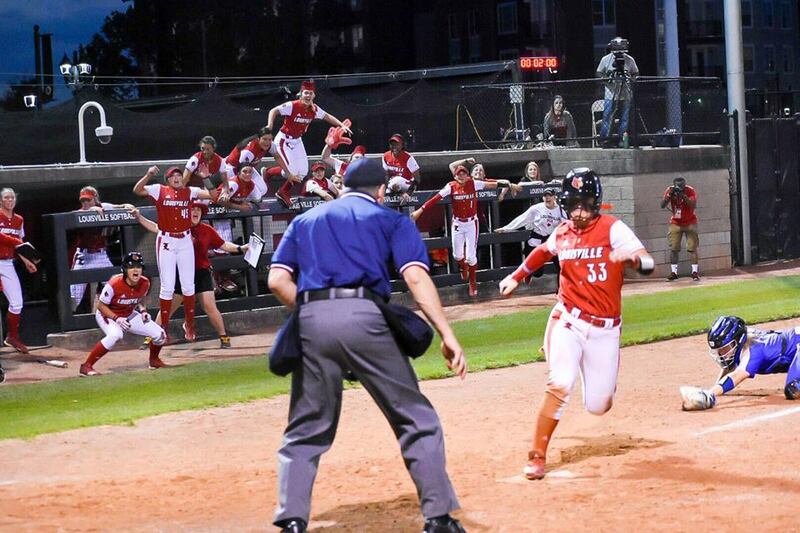 Celene Funke raced home from second base on a Taylor Roby single to center with two outs to end the contest -- before a screaming, on-the-edge of their seats crowd of over 1200. Someone call a producer, a director and let's get a made-for-TV movie out on this "three hour" tour of drama, intrigue, fright, mystery and...ultimately, triumph. ACT I -- THE STORM. The Cats were the first to rattle the fences in the newly named Don Dobina Field (more on that later). 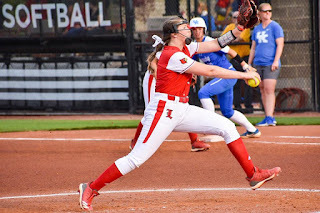 Louisville pitcher Danielle Watson was having trouble negotiating terms with the strike zone and UK used two walks and a single from protagonist Katie Reed to grab a 2-0 lead before the stands were halfway full. 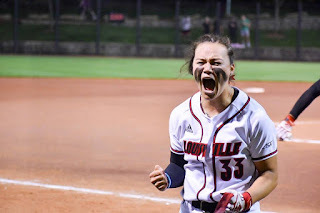 Undaunted, the UofL players turned the firm of Funke, Melton and Hensley loose on the case and they evened the feud at 2-2, aided by associate Rebecca Chung, who performed a magic act with a perfect bunt that allowed Melton to outfox the UK infield and score. The second inning brought more gripping moments, thunder and lightning action. Watson saw the bags fill up with Cats and a run scamper home after two walks, two singles and just one out. It looked dangerous on the horizon, so skipper of the boat Holly Aprile went to the galley and brought Roby to the circle to bail water. UK batter Alex Martens wasn't quite ready to produce her lightning bolt yet and Reed allowed the bailing to gather up her offering to get Louisville out of the inning trailing 3-2 -- in a situation that could have been much, much worse. In the bottom half of the second, Maddy Newman worked UK starter Grace Baalman for a walk, Funke decided that it was time to take the nation's lead in triples and smacked one to center...and then playfully danced home on Melton's slow infield roller that no one in the UK infield could seem to figure out what to do with. 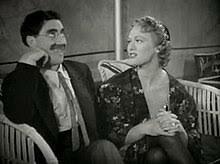 Tired of this Three Stooges comedy, UK head coach Rachel Lawson entered stage left and went for a change of channels and performers...sitting Baalman and turning to Autumn for relief (as in pitcher Autumn Humes). The final two piles of leaves were eventually raked up, but UofL held a 4-3 edge after the second inning. The storm front slightly weakened in the top of the third, with UK managing just one run at that at-bat. Right fielder Lauren Johnson pounded a "nearly outta here" triple to right center that got Keisee Henson around those square white things in the dirt for a home plate touch. Roby coolly gloved a line shot right back at her from Jenny Schaper to prevent "no more soup for Blue" but the Cats had managed to even out the see-saw at 4-4. Louisville decided that, if runs were guns, they were going to bring an arsenal to the affair in the bottom of the third. They decided to hold the "gunfight at the Ulmer corral" with two outs, as well. Funke produced a single to center, stole second and touched the plate on a booming Melton double. Remember those two actors, they come into play later. Not to be outdone, right fielder Megan Hensley rides her horse to the right center wall for a triple and motions for Roby to bring the rest of the cavalry. Roby responds and her triple to center clears the bases. The wide-eyed citizens of "Dobina-ville" emerged from the twister to see a 7-4 Cardinal lead on the main billboard in town. The plot changes after Martens takes the microphone for a solo performance of "How far was the home run I hit to right field?" in UK's top of the fourth. After her four-bagger, the clouds clear, the pitchers are sending the batters back to the dugouts with dust in their pockets. and "0-fers by their names and we see just one hit combined from both teams in the next five at-bats for the squads. It's quite the different pace, this smooth sailing. The chatter on the berm in the outfield is relaxed and the Louisville Fire Department, with two trucks and ten guys, takes in the action from right field, off Arthur Street. Aprile decides to rest Roby after 75 pitches, brings back Watson to the circle...but still no threat of impending stormy weather. It's almost like Jimmy Buffet concert on a sunny day in the park. Where are the beach balls and frisbees? Red #1 Louisville foam fingers dance in the breeze. Those UK clouds forming on the horizon? Forget about them, it's nothing. Still 7-5 Louisville as the teams go to the top of the seventh. Three outs to go and the Cards are victorious. I should really know better, by now...after watching this team all season...to think that's going to come about with ease and no drama involved. ACT III -- HANG ON FOR YOUR LIVES !! Who gave UK Freddy Kruger, Jason and Chucky's phone numbers? Unwilling to traipse quietly back to the buses waiting to haul them back to Lexington, the Cats brought in a threatening storm front. Vick singles, Johnson nearly puts one out for a double and it's 7-6. Schaper blasts a high, deep rocket to center and in what I'll call "the catch"...Funke sprints to the wall and makes an amazing catch for the second out...but the runner tags and scores. We got a ball game. 7-7. The Cards get Cheek to ground out, but the damage has been done. 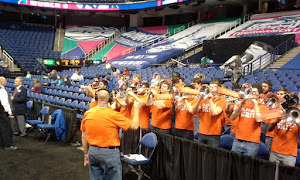 The UK fans in attendance are creating a ruckus. Louisville, backs to the wall, staring at extra innings....has one last chance. After Newman grounds out. Funke decides she is not in favor of playing bonus ball and singles to center. Melton embraces the "end-it-here" concept and smacks an opposite field, solid single to left to move Funke to second. The Cats stop the action, huddle around Humes in the circle and Melton and Funke are high fiving and chest bumping on the base paths. One'll do it. Two chances. Hensley digs in, works the count but chases a high one, misses and there are two outs. It's down to this at bat to end it or continue it. Enter the redshirt freshman from Mt. Washington. Roby strides to the plate. A tired Roby, after hurling 3.2 innings of ball, throwing 75 pitches and facing a "it's now or extras" scenario. On a 0-1 pitch, she taps a shot up the middle of the diamond, that flies by Humes in the circle, eludes middle infielders Reed and Martens and rolls into center-field. UK center-fielder Sarah Rainwater comes dashing in to retrieve it. She knows a throw to home to get out Funke is the only thing that can save UK now. Celene Funke has one speed. One notch on the gear-shifter and that is "D". She drives around third, no hesitation or thought of stopping -- and accelerates toward home. Schaper waits at the plate for the throw, the throw arrives but Funke's speed gets her to the plate ahead of the tag and....BOOM! ...it is over. Pandemonium and celebration erupts from the Cardinals on the field. The Cardinal fans are going crazy and this Oscar-type performance has drawn to a close. Somewhere, Don Dobina is smiling. Roby, the gal who carves his first name in back of the pitching circle with her toe before throwing, has sent him a tribute. Hollywood couldn't have written this one any better. Somewhere, Don is smiling and raising an "L" in celebration. A mid-week, out of conference win. Yeah, sure...some will view it only as that. In terms of the in-state rivalry and with emphasis on how this Cardinal Softball team refuses to yield and never stops fighting, though -- it was much, much more. Prior to the game, a field ceremony and dedication was held for Don Dobina and the field was named Don Dobina Field as a tribute to the softball pioneer who passed away in 2016. 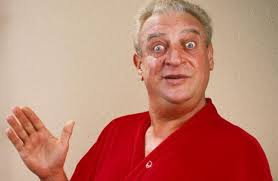 Don founded and was president of the Louisville Lady Sluggers Softball Club. He worked tirelessly toward the development of fast pitch softball. Dobina made it possible for hundreds of girls to have the chance to get scholarships and attend more than 70 universities. Seven players in last night's contest, representing both squads, benefited under the tutelage and teachings of Don. A fitting tribute to "Cardinal Forever" Don Dobina. His work shall not go unforgotten. 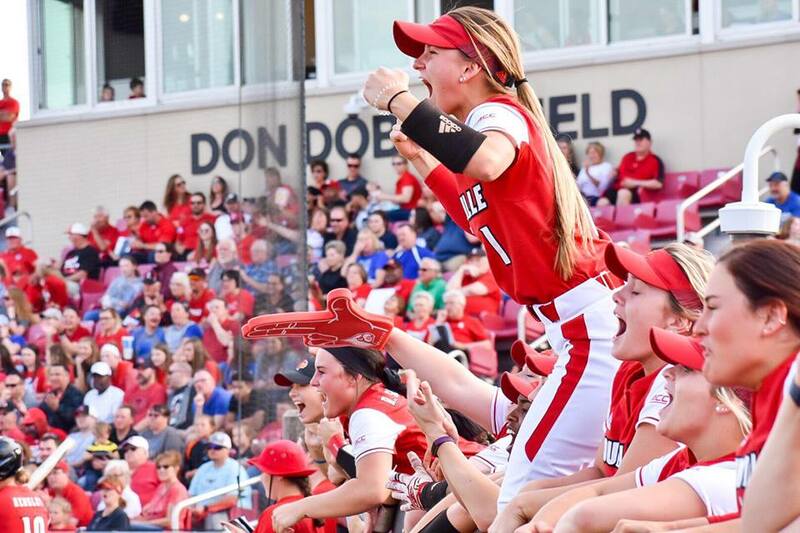 Tonight at 6:00 p.m. Louisville softball will host arch-rival Kentucky at Ulmer Stadium for a showdown between the state’s top two teams. Fans will scramble for what few tickets remain in hopes to catch a glimpse of the action. 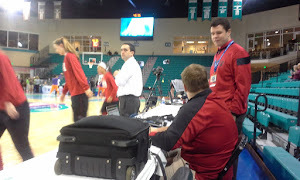 The Wildcats enter the game ranked 24th in the country and hold a 26-17 record on the season. Of those 17 losses 12 come against ranked opponents. They sit at 9-9 in one of the strongest softball conferences in the modern era, the SEC. Overall, Kentucky’s pitching has been consistently good. The five-person lineup holds a 4.16 ERA as opposed to opponents’ 7.97. This young group has struck out 207 batters on the season (almost 5 per game) with Grace Baalman leading the charge with 77 on the year. Kentucky holds opponents to a .248 batting average but opponents have scored often once a runner reaches base. Abbey Cheek’s .482 batting average makes her threat every appearance at the plate. She ranks fifth in the country with that mark. Cheek’s 16 home runs puts her in a tie for 11th in the NCAA. Her on-base percentage of .628 ranks second. 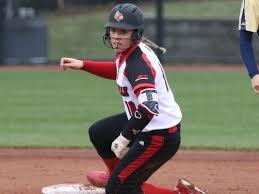 Her 41 walks almost tallies one per game and is fourth in the country. Kentucky’s offense averages 7.05 runs per game, putting them 12th in the country. Louisville comes into the game with a 27-15 record and is coming off back-to-back conference series victories. 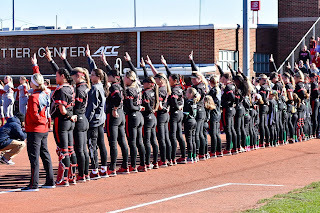 Their 8-7 conference record places them sixth in the ACC, although their .659-win percentage on the 2019 season is fourth-best in the conference. Celene Funke remains tied for first in the country with nine triples. Sidney Melton comes in tied for 28th in the country with four. Melton is first on the team with a .331 batting average. Four Cardinals hit between .310-.320. Funke and Melton are swiftly approaching the 50-hit mark with 47 and 45, respectively. In the circle, the Cards have a combined 2.74 ERA. The crew has a combined 243 strikeouts with Danielle Watson’s 116 contributing almost half of the total. 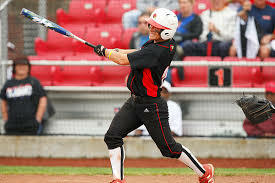 Louisville has held opponents to a .223 batting average. As a team, Louisville averages .56 triples per game, second best in the country. They have batted .283, a mark that should hopefully improve in the future. The Cards like to run and have successfully stolen 77 bases on 90 attempts compared to opposing teams going 33-42. Plan to arrive early to accommodate for parking and a larger crowd. The outfield berm area is considered outside of the stadium and is free for anyone to hang out. This game will be aired on ACC Network Extra and is the first time Holly Aprile gets to face the Cats in the regular season. Tonight's game is a "red-out" event, so choose your outfit appropriately. UofL is also offering a "swap out"...bring a UK shirt, hat or such and you can swap it out for something in red at the tables inside Ulmer Stadium -- located close to where you first walk in. (That swap-out probably doesn't include relatives or neighbors). 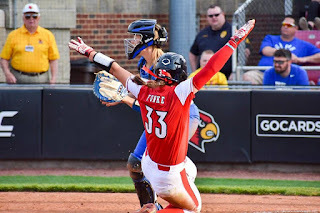 Let's hope softball can do what their baseball counterparts did last night (W 18-6) but preferably not as long as the four and a half hours the game in Lexington took last night. Tonight's game will be my 59th photography event of 2019... 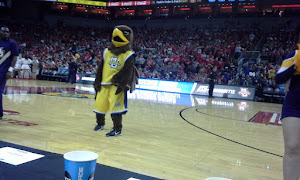 I know, I'm slacking..
CARDINAL COUPLE will have a pretty large contingent on hand for the annual battle tonight. Paulie, Worldwide, and myself should all be in attendance for this game. 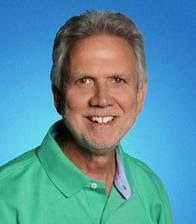 Our radio-show regular and Ky Women Talk Sports show host Daryl Foust will also be in attendance. She also contributes over at THE CRUNCH ZONE -- check her out! If you can't get a ticket for the event, it looks like a great night ahead for hitting the outfield berm, it is dog-friendly and you just never know who you might run into out there! Why not head to Floyd Street and take in the rivalry? There is a small fee for parking right across the street at the appropriately named Floyd Street Garage, which opens approximately an hour before game time for parking for the event. Once a year, University of Louisville student athletes gather to honor their own. The ceremony is called "the Louies" . They celebrate the successes of the various Cardinal athletes and squads. A time for dressing up and a time for joy. 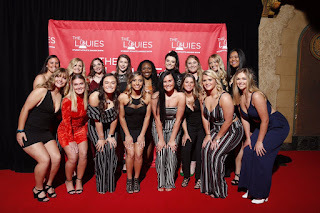 The Louies took place last night. Historic Brown Theatre was the venue. 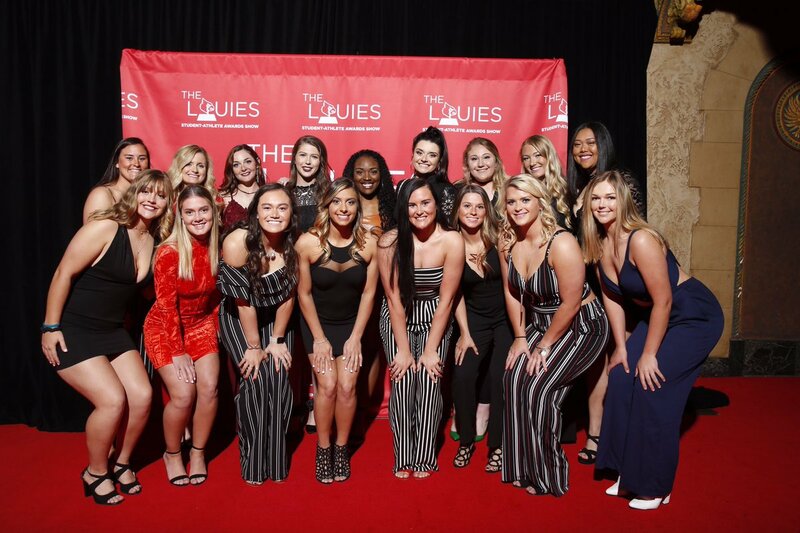 A wide variety of accomplishments and successes are covered on this very special night for Louisville Athletics and we think they all "clean up pretty well" for this occasion to embrace their collegiate peers. 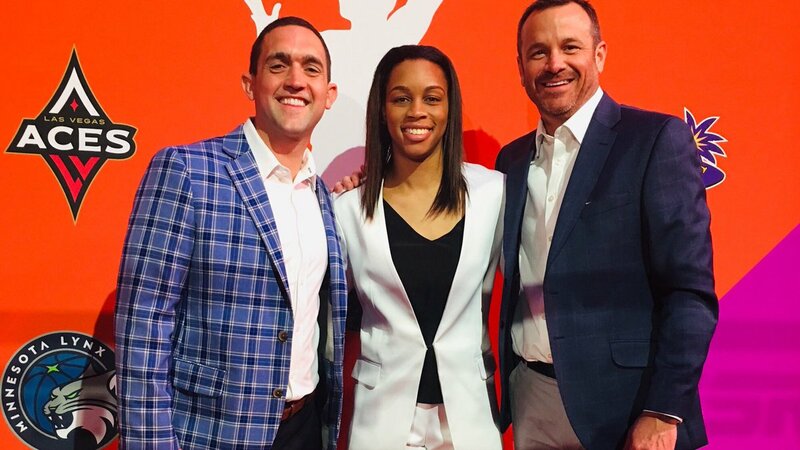 The adidas High Performance Athlete of the Year was awarded to Asia Durr (WBB), Mallory Comerford (W.Swimming) and Nick Albiero (M.Swimming). 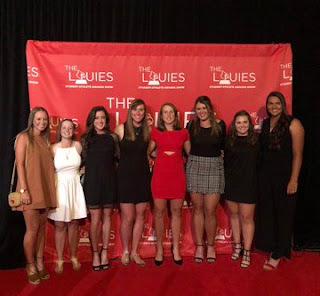 This is the highest individual award a Cardinal can receive in relationship to the Louies ceremony and certainly well-earned and deserved by all three. 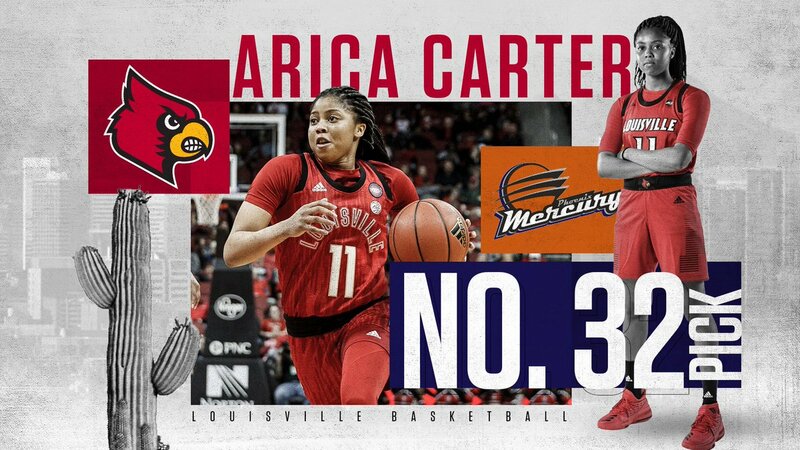 Arica Carter received the L1C4 award. 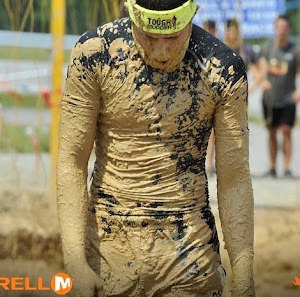 This is another high honor and goes to the student-athlete who best exemplifies the meaning of the athletic department's culture: humble and hungry. Softball's Celene Funke was named the female Breakthrough athlete for her scintillating sophomore season. She has rapidly become the voice, the spirit leader and the excitement example of Louisville Softball. Soccer's Emina Ekic took down the Comeback Player of the Year. After a devastating injury to end the 2017 season, she roared back and earned second team All-American honors in 2018. The full list below. A hearty and sincere "Congratulations!!" from all of us at Cardinal Couple to these student athletes and squad who have brought us so much joy on the venues of competition! It is said that one of the highest accomplishments one can receive is the recognition for a job well done by one's peers. 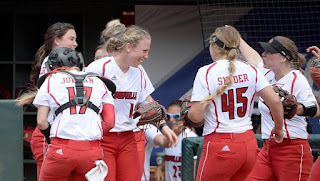 The Louisville Softball team missed Saturday's Thunder Over Louisville, so they decided to create a little "Thunder" of their own in Brighton, MA with a 10-2, six inning win over Boston College on Sunday. Megan Hensley provided the main fireworks with two home runs against Eagles pitching. She popped a solo shot over the left-center fence in the second inning and came back with a three RBI explosion in the sixth. Celene Funke was on the barge as well, and sent a two RBI, touch 'em all, shot to freedom in the fourth inning. All told, the Cards exploded for eight hits (six of them from Funke and Hensley) to go to 27-15 on the season and 8-7 in the ACC. Several walks allowed by Eagle pitching, a few well place bunts and some BC throwing errors allowed Louisville to build an early 1-0 lead after one, increase it to 5-0 after two and then watch the duo light the M-80's and cherry bombs that concluded the festivity. Taylor Roby took the circle to relieve Hensley with one out in the second and tossed a bucket of water on any potential Boston College flare ups with 4.2 innings of one-hit pyrotechnics of her own. We're hopeful that SB Cards didn't blast off all their explosives while in Massachusetts. 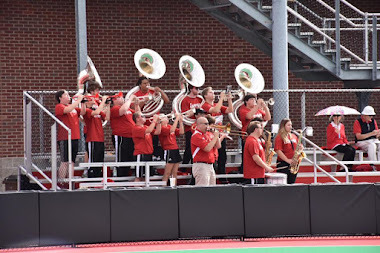 State rival UK comes to Floyd Street Wednesday for the annual Battle of the Bluegrass i Ulmer. CARDS WBB ADDS THREE TALENTED TRANSFERS. Jeff Walz decided to create a few fireworks as well over the weekend. Or maybe he has pre-Derby fever...because he just hit a huge trifecta. The Cards WBB program had three visitors over the weekend the seeing seeking brighter lights and big boom possibilities and found them in Louisville. Elizabeth Balogun and Elizabeth Dixon, from Georgia Tech and Kianna Smith, from California will be joining the roster for the 2019-20 season as transfers in and could have a huge impact and affect on Walz Ball down on the north end of Floyd Street. What a huge boost to the team! The "Elizabeths" are freshmen. Smith spent two seasons as a Cal Bear and was part of two NCAA Tournament teams. Walz continues to bring in answers for future needs and players that will light up the KFC YUM! Center for a very long time. BALOGUN was the ACC Freshman Player of the Year. The 6'1" Chattanooga guard was also ACC Player of the Week four times in the 2018-19 season. She is a scorer from about anywhere on the court and 13 points and 10 rebounds against the Cards when GT visited the KFC YUM! Center back on 1/13/19...one of her two double-double games on thee season. She amassed 437 points as a freshman, second highest in Yellow Jacket history. She started all 30 games last season. DIXON, a 6'5" forward, was named to the ACC All-Freshman team. She also started all 30 games for Georgia Tech and was named the ACC Freshman of the Week three times. 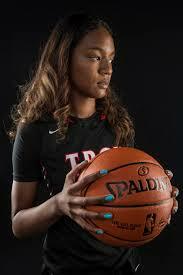 She's a powerful rebounder, runs the court well and led all ACC freshmen with 6.4 rebounds a contest. Her 11.0 p.p.g. She hails from Memphis and will add needed height to the Cardinals roster. 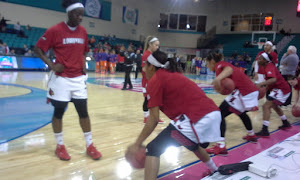 She had just 14 minutes against the Cards in the 1/13/19, 61-44 win but gathered six rebounds against the Cards. For future reference, she's called "Liz" a lot. SMITH, a 6'0" guard played at Moreno Valley during her high school days, scored 600 points in her two years at Cal. 91 three-pointers highlighted her career on the West Coast and she has 244 assists. She put up 20 against Oregon in PAC 12 play and had 18 against eventual National Champion Baylor in NCAA Tournament Second Round action. An exceptionally quick player who excels at long range shooting, she was on the PAC 12 All-Freshman team her first year and named to the PAC 12 Honorable Mention squad her second season. 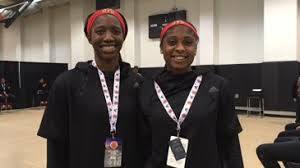 All three girls were McDonald's All-American selections in high school. 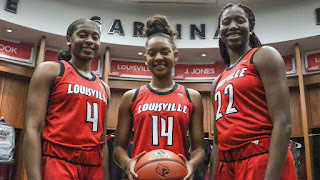 They'll join incoming freshmen Ramani Parker, Nyah Green and Norika Konno -- plus redshirt freshman Molly Lockhart and grad transfer Yacine Diop as Cardinals. Louisville also returns Yacine Diop from her injury -- plus returnees Jazmine Jones, Kylee Shook, Bionca Dunham, Dana Evans, Kasa Robinson, Seygan Robins, Lindsey Duvall, Jessica Laemmle and last year's walk-on Alexis Barlow. We, as fans, sometimes worry too much about when the timeline will suit our own hopes. In all probability, all three transfers will redshirt a year, learn Walz's system and get to know their teammates, the campus and take some time to acclimate. Maybe we should just celebrate their arrival and enjoy the aspect of them being here, instead of wanting to know when they'll perform. Walz has gone out and addressed needs. Give the man credit for work that has been accomplished. In our "microwave" society, we want it all and want it now. Sometimes we forget to savor the current moment. This is one to savor. In short, don't anticipate the "end of the concert". Enjoy the music that is currently being played. Question not, nor demand knowledge of the time frame. Just celebrate that it's happened. Join us in welcoming the three new Burger Girls to the Ville!! Join us in welcoming three excellent freshmen to the fold also. Sympathize with Paulie. How in the world will he learn all six new players' faces, personalities and styles all at the same time! Not bad stuff from a guy who got out-coached, according to a government source, to end the season. 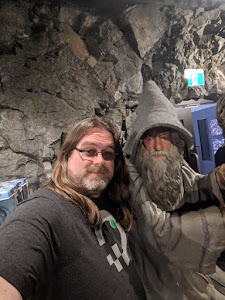 I suspect we should all just say, "Thank you, Jeff!" and "Thank you, players." for deciding to come here. We should do that a lot. 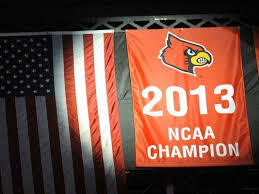 It's ALWAYS a great day to be a Louisville Cardinal. 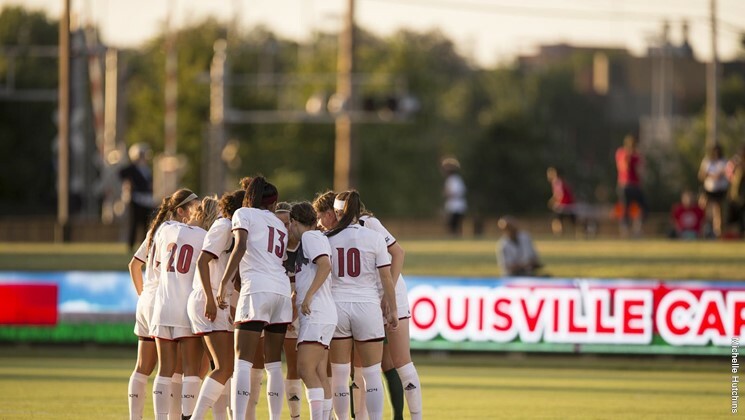 While most of the UofL women's sports results weren't the desired outcome yesterday, we did get a piece of good news, so we'll start there. Gabrielle Vincent, defender extraordinaire, and an absolute delight to interview as well, was added to the Utah Royals FC roster when it was unveiled this week. 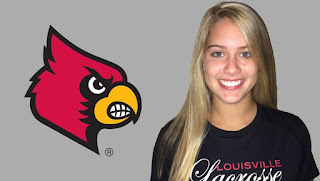 Gabrielle was a major part of UofL's stout defensive efforts over the past couple of years, and was frequently available for questions from the media at Fall Sports Media Days and other times. Royals FC is definitely getting a good one in Gabrielle, not only a quality defender, but also a personable and upbeat teammate to build a good team culture on. A back and forth affair in Brighton, MA, but the Boston College Eagles eventually came away victorious, 8-4. Most of the offensive execution returned to the top part of the line-up. surprise absolutely no one who has paid attention to the team this year, stole second. She finished the circuit on Sidney Melton's single. Unfortunately, the offense got started early for Boston College as well as they answered with 2 runs in the bottom of the 1st. The bottom of the line-up didn't go unrepresented in the offense, albeit in less conventional style, with Taylor Roby getting a single, Caitlin Ferguson getting plunked, followed by Kyra Snyder and Maddy Newman drawing walks to plate Jordyn Wolfe who had entered to pinch run for Roby. With the score evened at 2 after 3 1/2 innings, BC put up 4 to retake the lead and extend it to 6-2. They added a couple more in the 5th to reach their tally of 8 for the game. The Cards would rally some, but it wasn't enough. Sidney Melton doubled, and Megan Hensley took one beyond the fence to bring Melton home, with the pair bringing the score to the 8-2 final. The Cards and Eagles will decide the series today with a noon start, with ACC Network Extra being listed for video. the losing side, this was an effort that can be respected against a quality Top 10 opponent. UVA came away with the 16-12 victory. 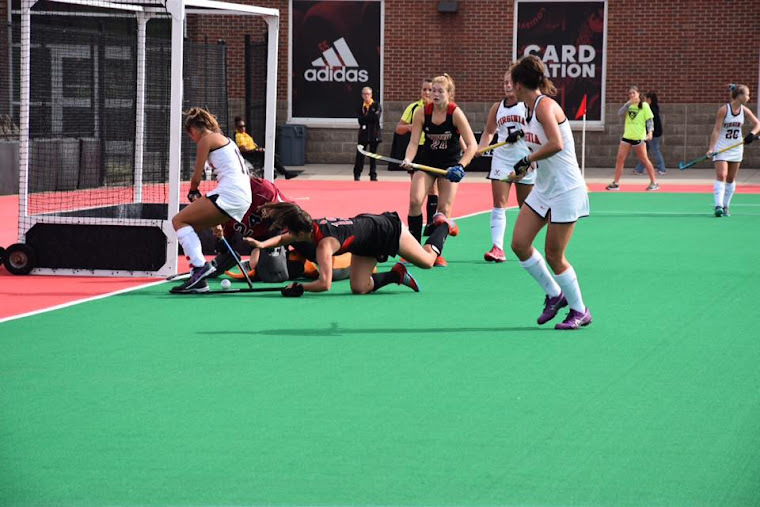 UVA got off to a quick start with the first draw control and a score just 10 seconds into the game, but the Cards didn't give up. They battled and kept the game close at 4-3 halfway through the first half. 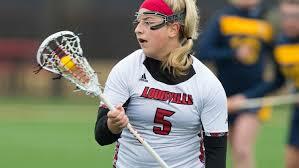 UVA went on a run, but UofL didn't fold, scoring two goals just before halftime bringing the halftime tally to 9-5. The Cards kept that momentum going opening the 2nd half, scoring another pair to draw within two at 9-7. UVA answered with a pair of their own to stretch the lead to 11-7. Most of the 2nd half was alternative scores, although UVA did sneak in a 3-0 run in the midst of it. UofL would score a final 2 in the last minute of play to draw the score to 16-12, but it just wasn't enough. The Blalock sisters both contributed, with 4 goals for Sarah, and 1 for Caroline. Tessa Chad and Alex McNicholas both got a pair, and single goals were also contributed by Kayla Marshall, Ally Hall, and Shayla Scanlan. 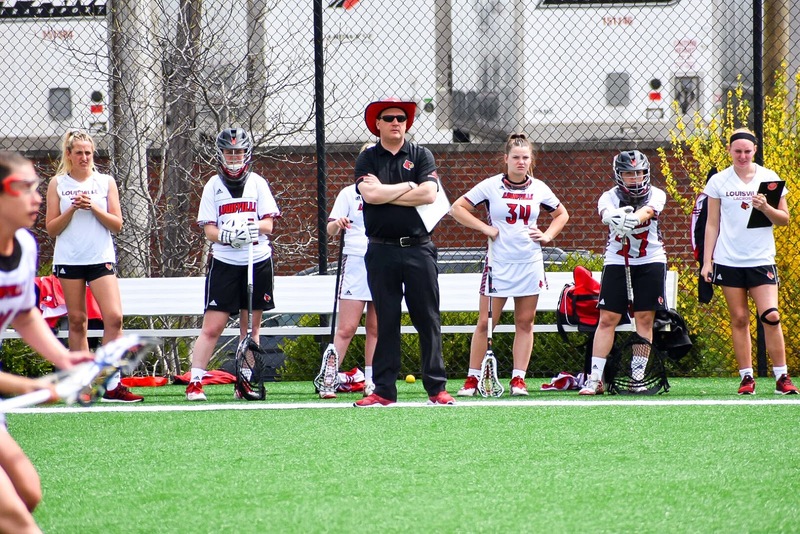 The Cards Lacrosse Squad will wrap up the season Saturday, the 20th at Boston College with a noon first draw. No video is listed for this one. The ACCNE will probably pick it up, one would guess. 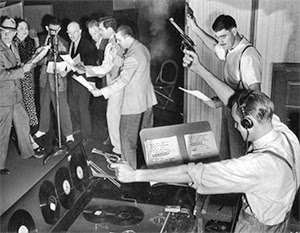 After a near-crisis with the computer that supplies our intro and exit music, walk up music, and various sound effects, the Cardinal Couple Radio Hour made it to air sonically intact yesterday. Jared was off banking, we were all scrambling for parking along the no-parking-for-Thunder Mellwood, and great fun was had regardless of all of that. After handing Florida State their first conference series loss since 2012, Louisville softball was rewarded with a mid-week break before heading northeast for a three-game set with Boston College. In the first game of that series yesterday, Louisville saw the struggling hosts (13-24, 3-10) jump out to a 2-0 lead through four innings. After holding everyone at 0 runs in the fifth, Louisville decided that they didn't want to lose to the Eagles. The Cards put up 5 runs in the top of the sixth inning and added another 4 in the top of the seventh for good measure. Boston College was unable to score anymore runs and a 2-0 lead turned into a 9-2 loss for the home team. Megan Hensley got the start and was okay through her three innings. She allowed just one hit, but walked three and allowed a run. She was lifted at the beginning of the fourth for Taylor Roby. Roby allowed a run as soon as she entered, but also allowed just that one run and one hit. After Roby bookended a strikeout in the sixth inning with a pair of four pitch walks, Danielle Watson came in to get the last out of the sixth with runners on first and second. Presumably to save her arm for the rest of the series, Watson was pulled after her one out performance with the Cards holding a 9 run lead going into the bottom of the seventh. Roby finished the game out with a 1-2-3 inning and that was all she wrote. 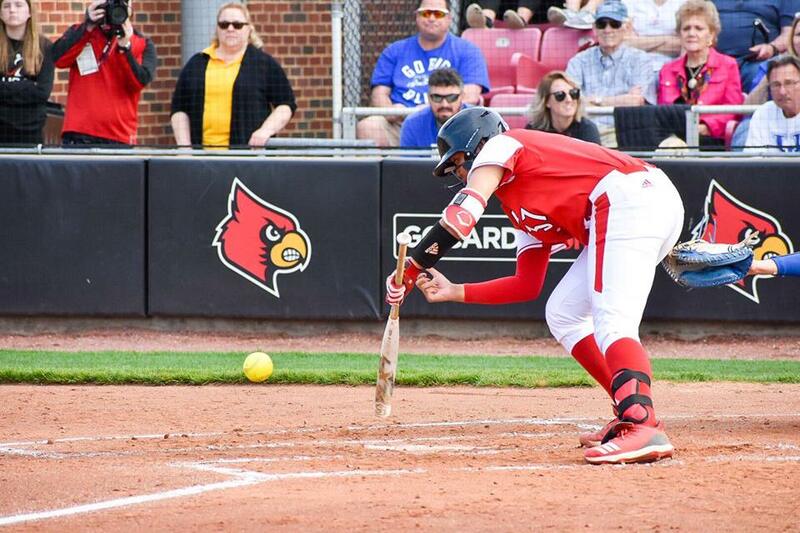 Though the Cardinals' offense didn't cross the plate until the sixth inning, a Louisville batter reached base in every inning prior except for the fourth. All told, the Cards would finish with nine hits and draw four walks. However, they did strike out six times collectively and left eight runners on base. 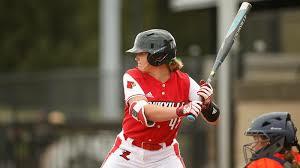 Louisville was not led by the usual suspects, as Maddy Newman and Charley Butler picked up 6 of the 9 RBIs. Newman finished 2-3 at the plate and drew a walk, while all of Butler's RBIs came off of a bases loaded double. Kyra Snyder also had a big day at the plate, going 3-4 and knocking in a run. Sidney Melton had an unusual day to forget, going just 1-4 at the plate and drawing a walk, but leaving 4 on base. The Cards will look to take the series and set up a potential sweep in game two of the series today at 1PM. Louisville will hope to have a bit more consistent bats in today's game. The game is listed on ACC Network Extra, so if you aren't down at the Waterfront for Thunder Over Louisville, tune in at home. If you are down at the Waterfront and have unlimited data, feel free to tune in on your phone, or keep up on Twitter. The Cards are down in Georgia for the Liz Murphey Collegiate Invitational and are taking on tough squads from mostly the SEC. Louisville dropped a pair of team matches yesterday in an individual match play format to a pair of ranked SEC teams. The first came against #6 Arkansas, with Louisville earning a pair of wins from Mairead Martin and Lauren Hartlage, but ultimately falling 3-2 overall. The second loss came after Louisville battled to an all-square finish with wins from Margot Bechadergue and Olivia Cason and a draw from Delaney Shah. Ultimately, Florida was granted the win on overall margin of victory after an unfortunate 6 and 5 finish from Lauren Hartlage. Louisville got back on the course this morning just after 8AM. 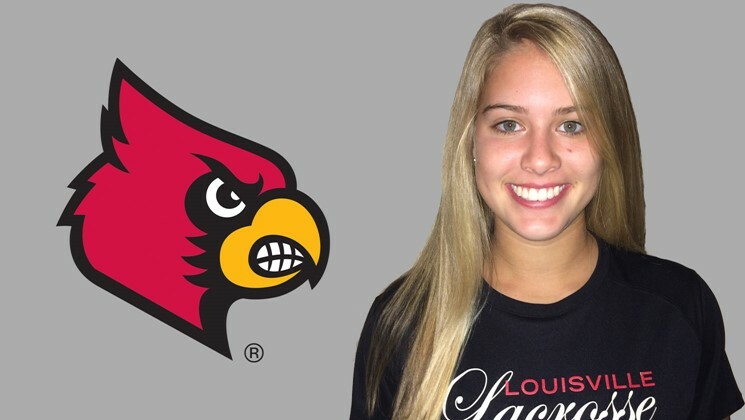 Louisville swept the hammer throw in both competitions yesterday and had three finishers in the top six on the women's side. Makenli Forrest took home first place and was followed by Carsen Cassell and Halee Hudson in fifth and sixth. Forrest's first place throw was nearly 10 meters further than Cassell's fifth. No other results from the women's side were listed for yesterday, but the competition continues today. year, but the honor went to Oregon's Sabina Ionescu. 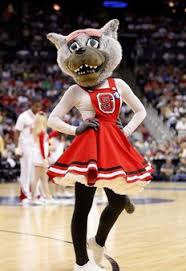 The junior decided early in the month to return to school instead of trying her luck in the WNBA Draft. Ionescu winning was a surprise to many, including Ionescu -- who sat there open-mouthed in amazement when her name was called. 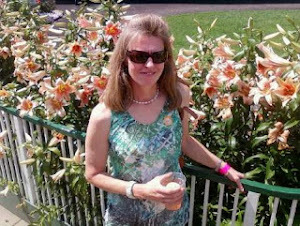 Many thought Durr or possibly nominee Megan Gustafson from Iowa would get the nod. Just goes to show that we don't always get what we want, but Durr had a huge season and it is an honor just to be named in the final five. The other finalists were Tearia McCowan and Napheesa Collier. 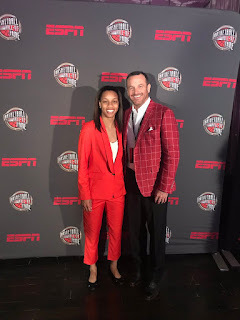 Jeff Walz was in L.A. with Durr for the awards ceremony. 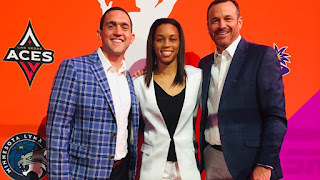 Durr, who was selected #2 in the recent WNBA Draft, is headed to New York to play for the Liberty and many experts think it'll be a great fit for her. Someone make sure and notify Matt Bevin. As Jared mentioned yesterday, he's out of the studio today, but we still have plenty of show to bring you today leading up to the Thunder Over Louisville Air Show this afternoon. 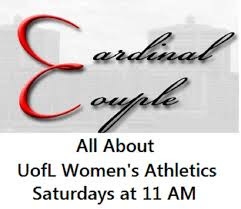 Paulie, Jeff, Daryl, and I will talk plenty of softball, lacrosse, WNBA draft, and more on this week's Cardinal Couple Radio Hour. As always, the show begins at 11AM on WCHQ FM and will be available on 100.9 FM, wchqfm.com, the WCHQ App, and on Facebook Live. Tune in and join us, won't you? Despite campus being relatively quiet this coming weekend things are pretty packed for the women's sports at Louisville. 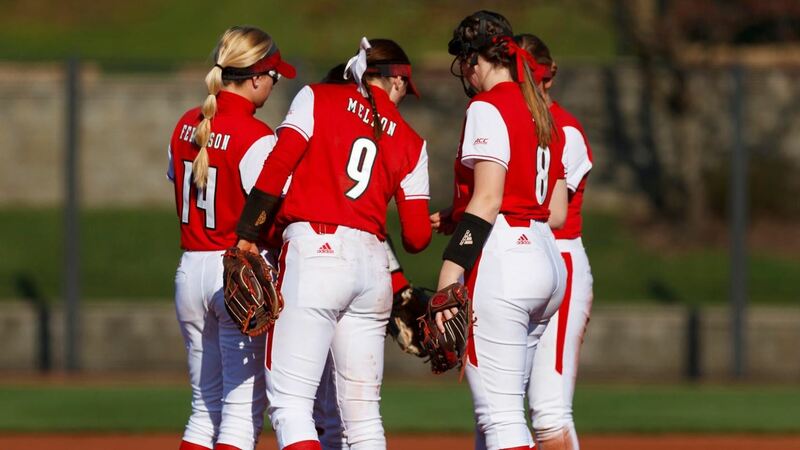 Softball is set to play a three-game series up in Brighton to face Boston College. The 13-23 Eagles have been less than stellar this season but have won their last two games. They have been outscored 211-126 this year. The Cards are 25-14 on the season and 6-6 in the ACC. 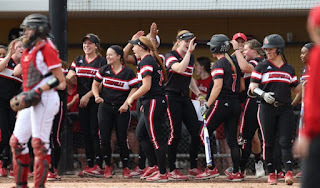 Louisville is coming off a series victory against Florida State, arguably two of the biggest wins in program history. 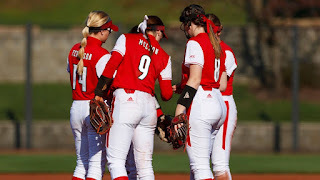 Danielle Watson and Taylor Roby have led the pitching force recently while Celene Funke's 43 hits and Sidney Melton's 42 hits are the best on the team. Rebecca Chung has a team-high 27 RBIs with Megan Hensley's 26 and Melton's 25 are close behind. Funke is still tied for first in the NCAA with nine triples. Lacrosse heads to Charlottesville to face #7 Virginia on Saturday at noon. The Cavaliers have scored 201 goals on the season and are led by Avery Shoemaker with 41 goals and 54 points. 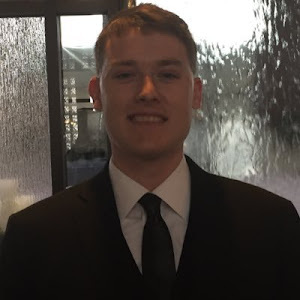 In goal, Charlie Campbell has close to a .500 save percentage with 132 saves. Chad's 53 goals ranks 6th in the NCAA. Rachel Florek is approaching triple-digits in saves with 97. Women's Tennis will conclude their regular season in Tallahassee against #12 Florida State on Saturday at noon. The Cards have lost 10 straight and 13 of the last 14. Raven Neely's 16 wins are a team-high. Nikolina Jovic is also in the double-digits with 12 wins. Track and Field will be at home, hosting the Louisville Invitational on Friday and Saturday. Michigan, Michigan State, Purdue, and Notre Dame will be the other teams competing against the Cards over at Cardinal Park. Women's Golf will be in Atlanta the entire weekend competing in the Liz Murphey Collegiate. Four of the teams appearing are ranked in the Top 25. 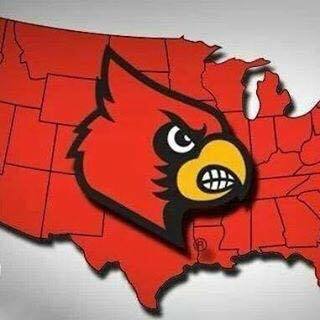 Louisville is ranked 42nd in the country. Arkansas, Florida, South Carolina, Alabama, Ole Miss, Kennesaw State, Georgia, Augusta, Denver, Iowa, and Daytona State will be the other competitors in the heavy-SEC field. Also in town is Thunder Over Louisville. 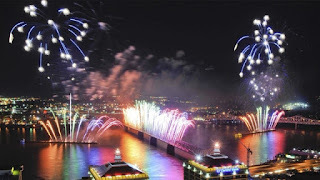 Between the Louisville Bats game, the air show, the fireworks, and more you can expect the crowds to be just shy of a million people, more than the entire population of Louisville. Close to 60,000 shells are expected to be used in the largest annual firework show in the world. The 30-minute display is definitely a sight to behold. For those electing to attend Thunder Over Louisville please plan accordingly with traffic and weather. I would highly recommend getting tickets to the Bats game. If nothing else you have access to plumbing and electricity and can hang out with me in a good place to view the airshow and fireworks show. Radio, radio...oh, who hid the radio? I will NOT be present tomorrow morning for The Cardinal Couple Radio Hour (please hold your applause until the end of the performance) but the other knuckleheads and Dynamic Daryl will hold down the fort to discuss all things women's sports -- so tune in or give us a look! Air time is 11 a.m. Emanating from the magnificent, majestic media mansion on Mellwood. 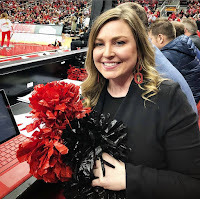 Bringing you the only show on the radio waves that devotes an hour to the joy and excitement of women's sports at the University of Louisville. 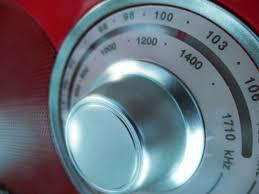 WCHQ 100.9 FM would be the digits you need to know and can easily picked up down by the river. 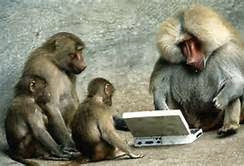 We can also be accessed via Twitter @WCHQFM. 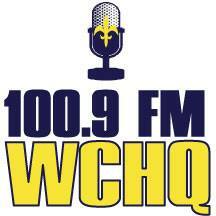 Download the WCHQ app while you are there. 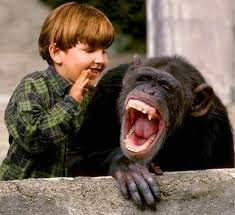 There's link to listen to the station and its current broadcasts at www.wchqfm.com and people report to us they listen to us that way. 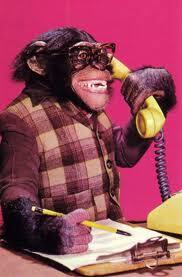 Paulie recently fielded an e-mail from a listener who accessed us, through the website, from Eugene, Oregon. She was complimentary of the show and was thinking about maybe doing something similar on a college campus station up there about her school's women's athletics. We broadcast the show on Facebook Live as well. Have a look, comment and tell a friend! Unfortunately, we aren't available via DoorDash or Uber Eats. Yet. Asia Durr was selected second overall in the WNBA draft for 2019 last night by the New York Liberty and teammates Arica Carter and Sam Fuehring were picked by WNBA squads in the third round of the draft. 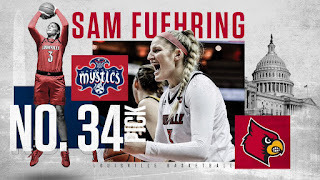 Arica went to the Phoenix Mercury as the 32nd pick and Sam to the Washington Mystics as the 34th pick. It is the second time three Cards WBB players have gotten picked by WNBA squads in the same season. 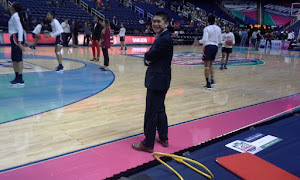 Back in 2014, Shoni Schimmel went eighth to the Atlanta Dream, Antonita Slaughter was the 35th pick in round three by the Los Angeles Sparks and Asia Taylor was the final, and 36th. 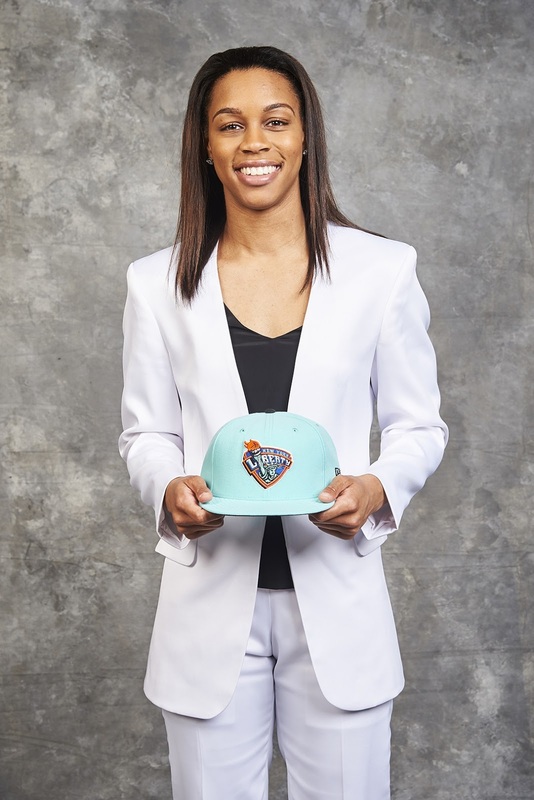 pick of that year's draft, going to the Minnesota Lynx. All told, 11 University of Louisville WBB players have heard their name called by WNBA teams inn the past 19 years. 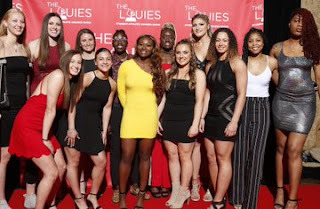 Jill Morton (2000), Lori Nero (2003), Angel McCoughtry (2009), Candyce Bingham (2009) and Myisha Hines-Allen (2018) are the previous selections who played at Louisville. A bit of a surprise, for many, to see Durr go second and not first. Jackie Young, from Notre Dame, who recently decided to skip her senior year with the Irish -- was the #1 selection and will go to the Las Vegas Aces. 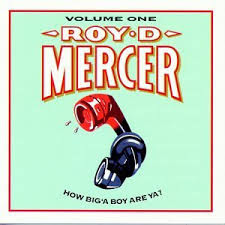 It's hard to say why the Aces went with Young instead of Durr...although some analysts thought that Young's game would be well suited for the Aces, though and Durr goes to a club, in the Liberty, that finished 7-27 last year and has no real standout scorers besides center Tina Charles. 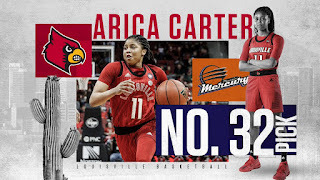 Arica joins a squad in Phoenix that has Diana Taurasi as their main guard and also the duo of Brittney Griner and DeWanna Bonner in the paint. Phoenix made it to the finals of the WNBA Playoffs last year before losing to the Seattle Storm in three straight games. For Sam, a chance to reunite with Myisha Hines-Allen in Washington. The Mystics, 22-12 last season, feature Elena Della Donne as their main scorer. All in all, the first round featured five ACC players getting selected (Young, Durr, Arike Ogunbowale, Kiara Leslie and Brianna Turner). Two players from the ACC went in the second round -- both from Notre Dame (Jessica Shepard and Marina Mabrey). 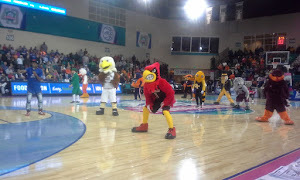 The third round featured four ACC stars (Carter, Fuehring, Paris Kea and Regan Magarity). The 11 ACC picks were, by far, the largest representation from a conference. The PAC 12 and SEC had four players drafted and the Big 12 three. Five foreign players were also selected. It is the first time in WNBA history that a college team's staring five have been selected. Notre Dame had all five starters go in the first two rounds. The chance to play in the WNBA for three of Louisville's finest ever. 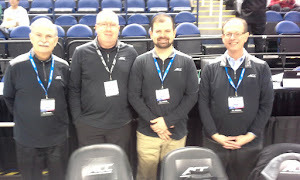 A tribute to the excellent coaching staff on the Belknap Campus. Players reaping the rewards earned by their hard work, dedication and commitment to getting better each day. 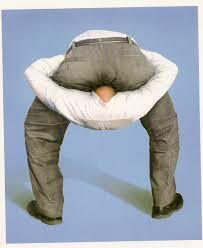 Jeff Walz? Yeah, he's worth every penny and then some. What's that, Matt? He can't coach? (The following is Paulie commentary on Matt Bevin's recent slander on social media and on-air of University of Louisville's head women's basketball coach Jeff Walz. It may not reflect the views of the other writers and staffers here at CARDINAL COUPLE...but, that's never stopped me before). "Put the child down, Matt. Don't eat the baby! BAD MATT!" 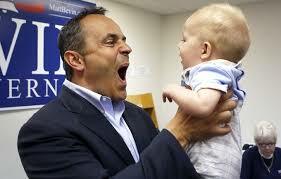 Fellow Kentuckians, how does it feel to have the stupidest governor in the United States? Matt Bevin just can't seem to control himself, when it comes to popping off about things he has no knowledge of -- or, to get "digs" in on the city of Louisville. The man must really have something against those who teach. 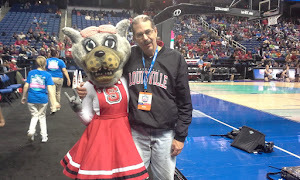 Even teachers who develop college student-athletes here in our fair city. I can't make this stuff up, kids. He really is that much of a moron. "If he had been a little more focused on game strategy and coaching that weekend and a little less on this kind of silliness, the better team would have won"
Uh, Jeff Walz did not get out-coached, dear Matt. The Cards ran into a UConn team that was on-fire from three-point range, playing in front of their fan base in an arena where they were undefeated and...still...Louisville managed to cut the lead late to two. You didn't see any of this, of course. You were too busy congratulating UK BB players and smiling while UK paid an incredibly stupid amount of money to a coach who hasn't gotten his team out of the Elite Eight in the past five years. You wanna talk about getting "out-coached"? Yep. 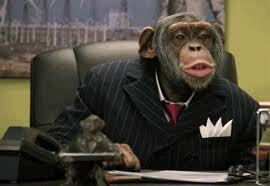 Matt Bevin. College basketball expert. Coaching genius. Our governor. Our disgrace and embarrassment. 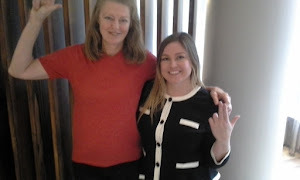 Hey, Samantha Williams just got the EKU job (oblivious to Bevin of course..there is only one university in the state, to his knowledge. 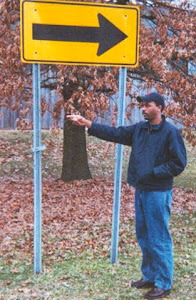 and it's somewhere east of Frankfort, he thinks). Walz could assign him laundry room duty and have him check the inflation levels of the team's basketballs, run towels to sweaty players, refill hydration bottles and sweep the floor after practice. Hand him a player/coach identification guide with a picture next to the name. Nah. That might be over his skill level. Can we just get this guy out of office? Can we just get this clown to shut up? Go away, Matt. NO ONE is interested in your analysis of coaching proficiency. I know five-year olds with more basketball coaching knowledge than you. It's like a little-leaguer telling Albert Pujols how to hit home runs. Just hush, Matt.